New York State DMV Vision Registry Provider! Come in today and bring out the fashionista in you! 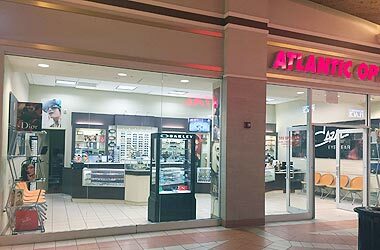 Located in the Atlantic Terminal Mall, Atlantic Optical is New York State DMV Vision Registry Provider! At Atlantic Optical you do not have to compromise style for functionality. Regardless of your visual requirements, we have designer frame eyeglasses and sunglasses that will allow you to see great, look great and feel great. We have a beautiful selection of designers to bring out your fashion ... AFFORDABLY! All of our designer frames and sunglasses are priced for every budget, including Fendi, Gucci, Chanel, Versace, Prada, Dior, Tiffany, and many more. See our hand-picked designers! We offer prescription eye exams for eyeglasses, sunglasses and contact lenses. We also provide contact lens fittings as well as follow-up consultations. We fit our patients with lenses like Acuvue, Freshlook, Bausch & Lomb, and daily wear, just to name a few. Our selection of frames are for those who know how to draw the most out of life and view fashion as an expression of their personality. Did you know that a comprehensive eye health examination can detect diseases like Glaucoma and Diabetes, that not only affect your eyes, but overall health? We can detect even the smallest changes in your vision and eye health. Our diagnostic equipment helps us ascertain your risk factors for many debilitating eye and body diseases which, with early detection, can be managed in many cases. We believe in fast and efficient service. A majority of our patients enjoy receiving their prescription eyewear within 1 hour, and contact lens wearers are usually notified for pick up the next day after their visit. The reason we are able to provide this fast service is because of our long time relationship with the industry's biggest manufactures. We would like our patients to be able to choose correct eyewear. Our Exclusive frame collections focuses on classic, timeless and modern shapes in rich colors and unique patterns. We have an onsite state-of-the-art optical lab because it is important to us that we can control our quality. With our large inventory of designer sunglasses and designer eyeglasses, we can have your new look customized for you the same day in many cases, so stop in today and let us bring out the fashionista in you! Seeing 20/20 doesn't necessarily mean your eyes are healthy. Many eye problems can only be detected during a thorough eye exam.